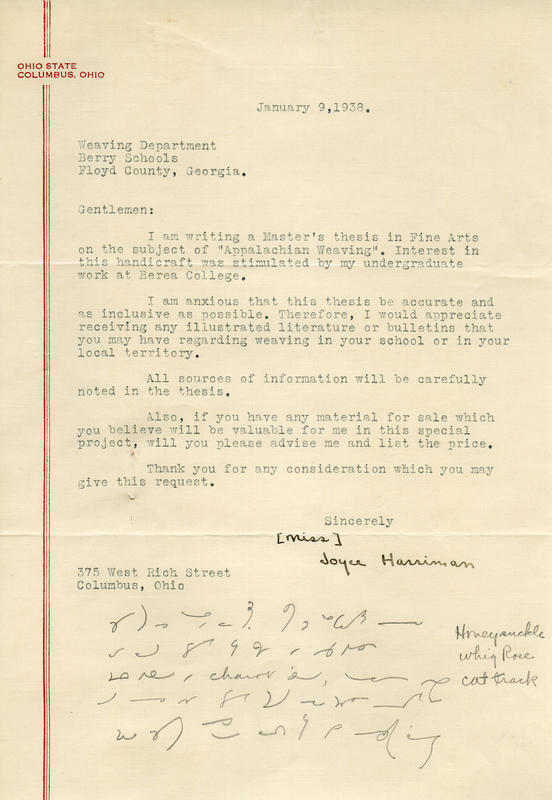 Joyce Harriman is writing her Master's thesis in Fine Arts at Ohio State on the subject of "Appalachian Weaving", and asks the Berry Schools if they have any literature or examples they can provide for her. Miss Joyce Harriman, “Letter to the Berry Schools from Joyce Harriman.” Martha Berry Digital Archive. Eds. Schlitz, Stephanie A., Olivia Mund, Justin Karch, Jessica Hornbuckle, et al. Mount Berry: Berry College, 2016. accessed April 21, 2019, https://mbda.berry.edu/items/show/14395.